Now here's when I get a little cheesy on you.. make sure you use good ingredients. When you make this at home you can control what goes in this pizza party so make sure you use wholesome, organic ingredients without preservatives, unecessary loads of sugar, pesticides, antibiotics, growth hormones and get uncured pepperoni to save your insides from carcinogenic nitrates and nitrites. Did I mention this pizza has a gluten free crust? But you would never know it! (Maybe I shouldn’t have even told you). Seriously though, I am never buying another store bought pizza crust again. 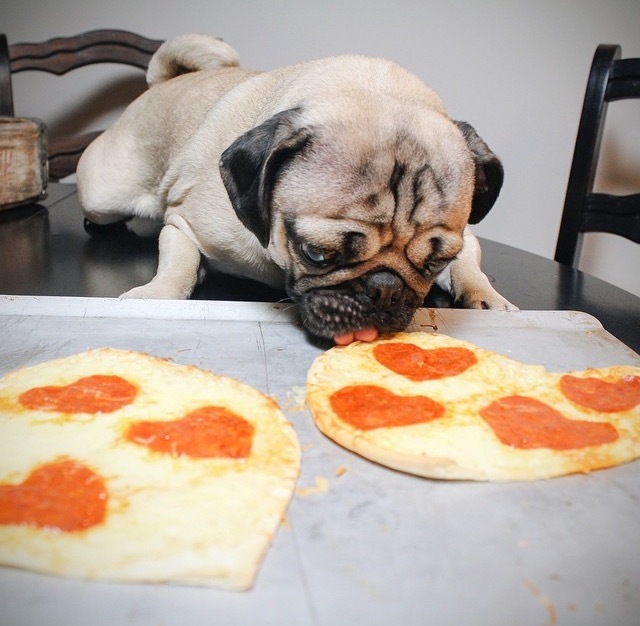 That’s how delicious this crust is. For all you gluten eaters out there don’t be afraid to try it! I promise it won’t disappoint. Spread parchment paper over a baking pan, set aside. In a large bowl, mix the flour, sea salt, baking soda and garlic powder. Add the oil, egg and vinegar to the flour mixture, making sure to mix well. Roll the dough into a ball and flatten out on to your baking pan. Make sure to flatten it evenly then roughly shape into a heart. Sprinkle sea salt on crust then bake for 7 minutes. After 7 minutes, take out the crust, spread on the pizza sauce and top with cheese and your heart pepperonis and then bake for an additional 8 minutes. Take out, let it cool for a minute or two then eat your heart out! Break the Fast with the Healthiest Smoothie!